The Harriers made their first signing of the up-coming season today when wideman James Dance put pen to paper in a deal from Luton Town that see's him sign a one year contract from July 1st. He signed for Luton in July 2011 and had a good but unspectacular first season with them. Expected to kick on in the following season he suffered an early, bad, injury that saw him miss out on the first half of the season before being sent out on loan to Nuneaton in the New Year where he made five starts in fifteen games and scoring twice. He didn't play against us in our narrow 1-0 win there in February. 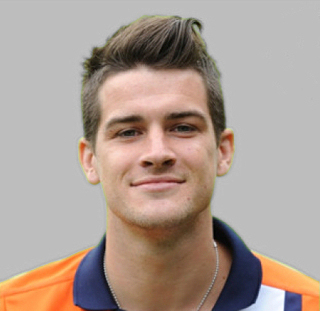 James started his career at Redditch under Gary Whild before moving on to Kettering Town and then to Crawley for the last few months of their promotion season before being released to join Luton. Let's hope that his career finally gets under way properly at Aggborough. In other recent news in this traditionally quiet time of the year we have seen the departure of Mike Williams and Keith Briggs. Briggsy joined up with newly promoted FC Halifax yesterday while Mike is still on the look out for a club. He was expected to sign for Chester and be re-united with brother Marc once again but Marc was also, surprisingly, released last month putting the mockers on that theory. Most of last seasons squad have been offered or given new contracts but of those players yet to sign James Vincent appears almost certain to be signing for Inverness Caledonian Thistle very soon while Marvin Johnson has been rumoured to be in talks with Crewe. There has been no news so far about the futures of Danny Pilkington, Ricky Shakes and Martin Devaney although Steve Guinan has now hung his boots up to take a duo management/coaching rôle with the Harriers and Stourbridge College.